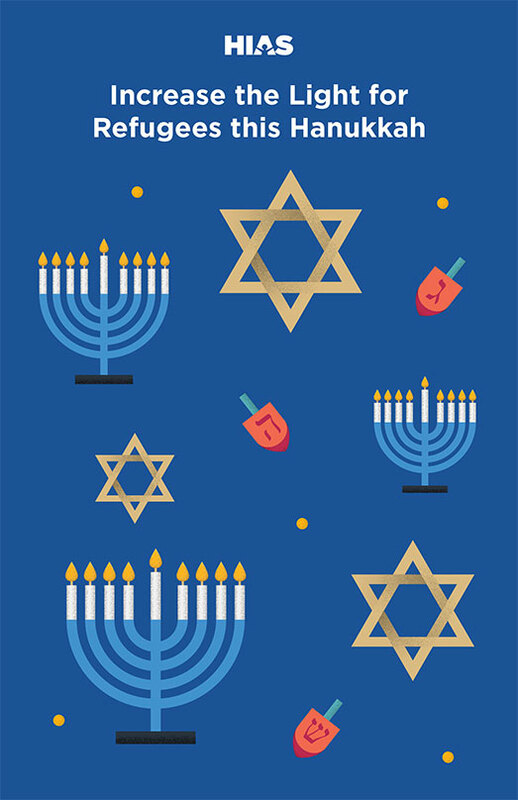 This Hanukkah, HIAS offers you 8 ways to support refugees – 1 for each night! In ways both big and small, we can all ensure that our Hanukkah celebrations increase the light in our world by taking action in support of refugees. 1. LIGHT WITH INTENTION. Bring refugees into your Hanukkah ritual by using HIAS’ 2017 Hanukkah reading as you light your hanukkiyah. 2. SPEAK OUT. Sign HIAS’ current petition and consider forwarding it to your network to sign, as well. 3. FIND COMMUNITY. Join the Jews for Refugees Facebook group to connect with thousands of Jews supporting refugees and sharing ideas for how to take action. 4. BUY FROM REFUGEES. Support refugees’ livelihoods by giving Hanukkah gifts made by refugees. Check out Refugee Council USA’s refugee-made product list to find the perfect gift for family and friends. 5. EDUCATE. Prepare yourself to advocate for refugees by learning more about the global refugee crisis. Read a book or watch a film on this list. You could even host a book club or movie night with friends! 6. READ WITH KIDS. Download HIAS’ Children’s Book to teach the littlest people in your life more about what it means to welcome refugees and learn more about refugee experiences. 7. JOIN THE MOVEMENT. If you are a member of a synagogue, ask your congregation to join HIAS’ Welcome Campaign – a network of congregations across the country taking action for refugees. If your congregation is already a member, contact your synagogue’s refugee committee to find out how you can get involved. 8. SUPPORT REFUGEES WORLDWIDE. Give the gift of helping refugees worldwide by donating to HIAS.